Heavenly cake recipes with ingredients from pastures and forests. During “Meisi’s journey through SalzburgerLand” former ski racer Alexandra Meissnitzer explores her hometown’s most special places: In Salzburger Lungau she got invited to the newly constructed Twenger Alm by mountain farmer Wolfgang Kocher. At Twenger Alm mountain farming is done the traditional way. In the kitchen the mountain farmer also uses fresh natural ingredients only. Butter, sour cream and cream cheese are produced from the cow’s fresh milk on a daily basis; blackberries are picked by hand. The result: heavenly cakes no hiker can resist. Stir sugar, eggs and salt with hand mixer until frothy. Stir oil in the mixture. Mix the baking powder with the flour and stir in little by little until the mixture is homogenous and creamy. Then season the dough to taste with vanilla sugar and rum. Line baking tray with baking paper and space out the dough evenly. 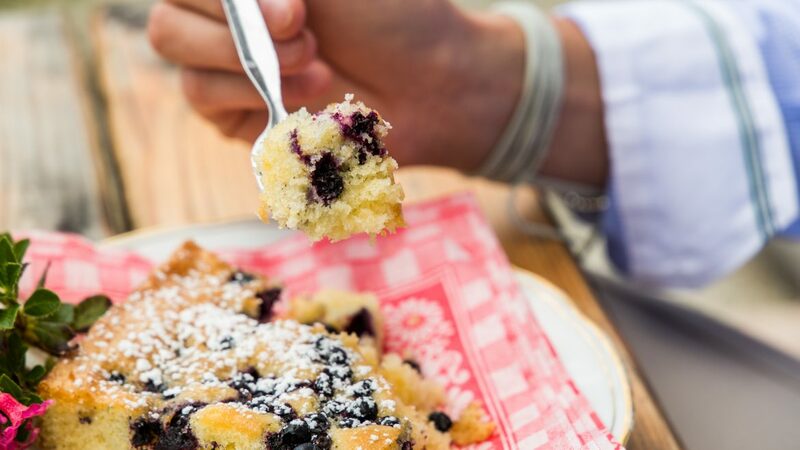 Scatter the blueberries side-by-side onto the dough. Bake the cake for roughly 20 minutes. Let the cake cool down, sprinkle it with icing sugar and serve with whipped cream if desired. Mix flour, baking powder, sugar and salt. Cut the cold butter in small pieces and mix with the mass. Then add the egg and milk and knead until the dough is smooth. Finally put dough in a cool place. In the meantime for the filling, mix butter, sugar, eggs and vanilla sugar until fluffy. Then stir in curd and sour cream. Butter a springform and dust with flour. Line the springform with the cold dough making sure to hitch up a small rim. Carefully spread the filling and smooth it afterwards. Bake the curd cakes in the preheated oven for roughly 30 minutes.